The page posted the heartbreaking video this past Earth Day saying, "Today, on Earth Day, we remember all the orangutans that have been left to starve and die." 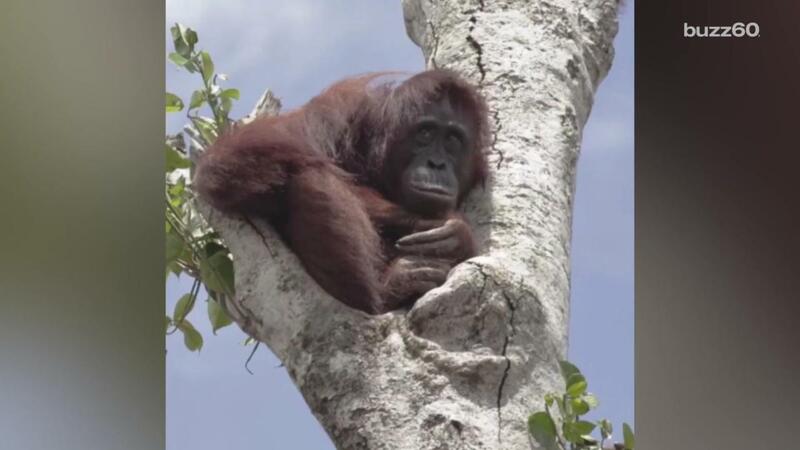 The video displays a lonely orangutan sitting on top of the last tree in its rainforest -- which was once populated by both many trees and many other orangutans. It was the lone survivor of poaching and deforestation. While the video was taken in 2013, its message is still relevant -- if not more so -- today. "It shows an orangutan desperately clinging to the last tree standing after her forest home was destroyed," the post said. This particular orangutan was saved, according to the International Animal Rescue: "Thankfully, our team reached this orangutan just in time and were able to translocate her to safety." Others, however, are not so lucky -- and this orangutan's story is all too common. Sumatran orang-utan Anita, 23, and her baby Atina, 1, eat a fruit at the unveiling of their new habitat in the Singapore Zoo July 31, 2007. The Sumatran orang utans are categorised as critically endangered with their population standing at approximately 7500 in the wild, according to Singapore zoological officials. Newly born Mexican gray wolf cubs, an endangered native species, are seen at its enclosure at the Museo del Desierto in Saltillo, Mexico, July 19, 2016. Baby pygmy hippopotamus 'Lani' walks on a path on May 17, 2014 at the Basel Zoo. Lani is one around 135 pygmy hippopotamuses in the European Endangered Species Program. Pileated gibbonon the tree in real nature at Khaoyai national park, Thailand. Two sand cats born on April 15, 2008 are pictured on April, 25, 2008 at the Amneville's zoo, eastern France. Sand cats are one of the smallest of the wild cats, ranging from Sahara in North Africa to the arid regions of Iran and Pakistan in West and South Asia. This Mountain Pygmy Possum is part of a breeding program at Healesville Sanctuary, 10 March 2007. Koola, an 18-year-old western lowland gorilla holds her newborn infant in her enclosure at Brookfield Zoo on November 6, 2013 in Brookfield, Illinois. WINCHESTER, UNITED KINGDOM - SEPTEMBER 01: Amur leopard cubs pictured enjoying their day at Marwell Zoo on September 1, 2016 in Winchester, England. THESE leopard cubs are only nine weeks old but already a media sensation. Two Amur leopard cubs made their first public appearance at Marwell zoo near Winchester this morning. The creatures are amongst the most endangered big cats in the world and these two young boys are part of a program to protect the leopard's future. Axolotls are seen in a cage where scientists of the Biology Institute of the National Autonomous University of Mexico (UNAM) are reproducing them at an experimental canal of Xochimilco in Mexico City February 13, 2014. Scientists at UNAM's Biology Institute have warned the Axolotl (Ambystoma mexicanum) or Mexican salamander, could be at risk of extinction in the wild in five to 10 years as axolotl populations were declining in 2003. But a few canals in the southern Mexico City suburb of Xochimilco, the only waterways where some axolotls may still live, are threatened by pollution caused by the city's continuous expansion and the days of the species in the wild are numbered. The axolotl is now on the endangered species list of the Convention on International Trade in Endangered Species (CITES). A greater bamboo lemur is seen in this picture released by Conservation International on July 22, 2008. Researchers in Madagascar have found critically endangered greater bamboo lemurs living far from the only other place they were known to exist, raising hopes for the survival of the species, experts said on Tuesday. A Dendrobates leucomelas frog is pictured at a terrarium in Caracas November 30, 2015. Venezuelan frogs and toads are in critical danger due to climate change as rising temperatures complicate reproduction and spread a deadly fungus, say scientists, who liken the species to canaries in a coalmine warning of imminent danger. The survival of a group of nearly 20 frog and toad species, which top Venezuela's list of endangered species, may rest on a small group of academics in a Caracas laboratory attempting to recreate the amphibians' natural reproductive conditions. Picture taken on November 30, 2015. Seven months old 'Nuan Nuan', a female giant panda cub, plays inside the panda enclosure at the National Zoo in Kuala Lumpur, Malaysia on April 8, 2016. Nuan Nuan, which means 'friendship' in Chinese, was named in a ceremony where her name was picked from almost 23.000 suggestions coming from the Malaysian public. A handout photo dated March 21, 2013 shows a short-eared elephant shrew swinging on his new swing in the Wilhelmina in Stuttgart, Germany. Short-eared elephant shrews grow only 22 to 24 cm long; half of the length is made up by the tail. They live in Africa and can reach a speed of up to 20 km/h. Owabi, a two-week-old monkey cub of the Cercopithecus roloway family, one of the 25 most endangered primate species in the world, is pictured with its mother, Nyaga, on August 2, 2012 at the zoo in Mulhouse, eastern France. An employee poses with an Egyptian tortoise during a photo call for Whipsnade Zoo's annual stocktake in Dunstable, Bedfordshire, north of London, on January 7, 2014. This picture taken on November 8, 2016 shows Andatu, a Sumatran rhino, one of the rarest large mammals on earth, at the Rhino Sanctuary at Way Kambas National Park in eastern Sumatra. There are no more than 100 left on the entire planet and Andatu -- a four-year old male -- is one of the last remaining hopes for the future of the species. He is part of a special breeding program at Way Kambas National Park in eastern Sumatra that is trying to save this critically endangered species from disappearing forever. A zoo keeper holds a baby Philippine crocodile during the annual weigh-in to record animals vital statistics at ZSL London Zoo in London on August 21, 2014. The "Indian" or "Java" rhinoceros is listed as a critically endangered of extinction, this rare animal has only one horn which marks the main difference with the African type. A female Northern Bald Ibis, also referred to as Waldrapp, warms her nest while two fellows protect her at the zoo in St. Peter-Ording, Germany, on May 5, 2008. A critically endangered small tooth sawfish roams its new home at Oceanworld in Sydney on August 18, 2011. Measuring over 1.5 metres in length, sawfish have adapted to live in both salt and fresh water, while their long saw-like rostrum (nose) has evolved to expertly forage for food under the sandy ocean floor. A giant soft-shell turtle which is considered a sacred symbol of Vietnamese independence is guided into a cage for a health check by handlers at Hoan Kiem lake in the heart of Hanoi. Thousands of onlookers cheered in central Hanoi on April 3, 2011 when rescuers captured for treatment the ailing and ancient giant turtle. Legend has it that the turtle is the guardian of a magical sword once used in the 15th century to drive out Chinese invaders. Concern has mounted in recent months over the health of the animal likely to be over 100 years old and one of the last of a critically endangered species -- it is one of only four Rafetus swinhoei turtles known to exist in the world. A Hypsiboas crepitans frog is pictured at a terrarium in Caracas November 30, 2015. Venezuelan frogs and toads are in critical danger due to climate change as rising temperatures complicate reproduction and spread a deadly fungus, say scientists, who liken the species to canaries in a coalmine warning of imminent danger. The survival of a group of nearly 20 frog and toad species, which top Venezuela's list of endangered species, may rest on a small group of academics in a Caracas laboratory attempting to recreate the amphibians' natural reproductive conditions. Picture taken on November 30, 2015. Ema Elsa, a nine-year-old Black Rhino, lies next to her newborn calf in their enclosure at Chester Zoo in Chester, northern England October 5, 2012. The female calf which is less than 48 hours old will join an international breeding program for the critically endangered species. "We are the last and only hope for orangutans in West Kalimantan, and the rainforest continues to be destroyed at an alarming rate. We are busier than ever before, desperately working to protect the forest that still remains," the rescue continued. The post urges for those who see the video to share it and to take care of our planet. "This Earth belongs to us all, we must protect and cherish it, before it is too late."